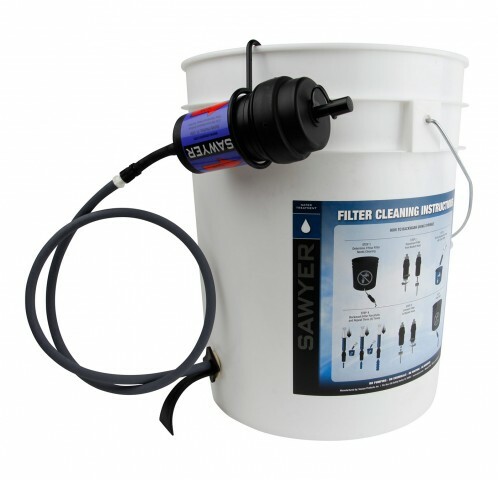 The Sawyer water filter is the water purification filter that I have used in disaster work throughout the world. The filter is easy to assemble, see below instructions, easy to use, and easy to clean. The water filter will filter more than 250 gallons of water per day. The water filters contain a high number of tiny ‘U’ shaped hollow fiber micro-tubes that trap contaminants while allowing decontaminated water to freely pass through at a high flow rate — eliminating the need to store water and reducing the possibility of water contamination after the filtration process. When the filter gets clogged all you have to do is to back-flush by pushing a syringe of clean water through the filter to flush out the contaminants and the filter is ready to continue cleaning water. There is nothing to break so the filter will continue to clean water for an unlimited number of years. 2 Use the hole cutter to drill a hole 1.5 inches from the bottom of the bucket (you can do this by hand). 3 Screw the connector, hose and filter onto the bucket. 4 Fill the bucket with water from any source, lower the filter head below the water line, and let gravity do the rest. Using technology taken from kidney dialysis, Sawyer® water filters use Hollow Fiber Membranes. Our filters are comprised of tiny "U" shaped micro tubes that allow water to enter into their core through tiny micro pores. The PointOne Filter pores are so small (0.1 micron absolute) that no bacteria, protozoa, or cysts like E.Coli, Cholera and Typhoid can get through. At 7 log (99.99999%) the filter attains the highest level of filtration available today and yet it has a very high flow rate due to the large amount of tubes. Each filter is certified for ABSOLUTE microns. That means there will be no pore size larger than 0.1 microns in the biological filter Simply put, it is impossible for bacteria to pass through the 0.1 micron filter. 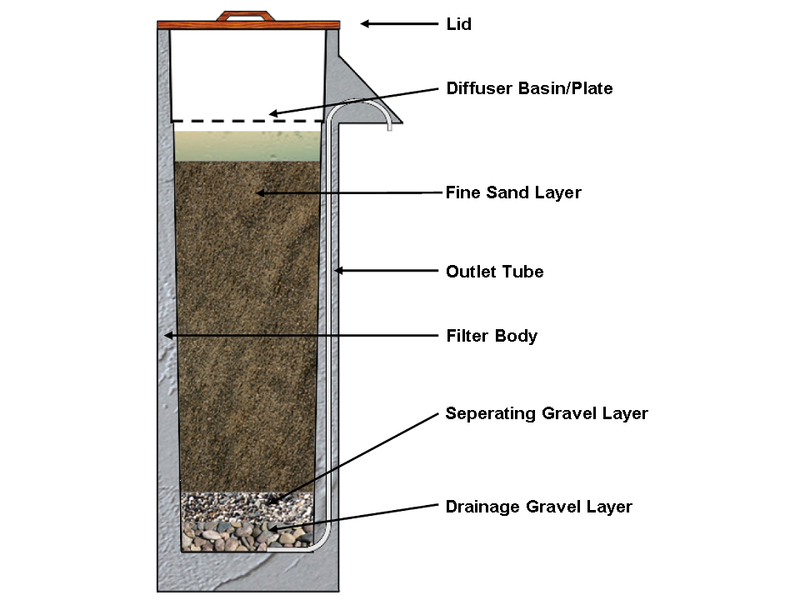 The bio sand filter works by pouring water through a diffuser plate at the top of the tank to distribute the water over the biological layer. 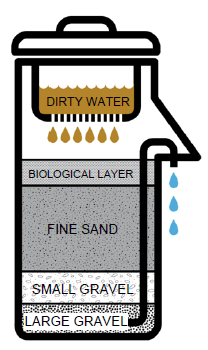 The water then goes through a biological layer at the top that eats the pathogens before continuing down through various layers of sand to further filter the water. The first layer, biological layer, is fine sand and continues through several more layers with each one being larger until the bottom layer, that is gravel. From there the clean water goes up a tube and when it reaches the diffuser plate the clean water comes out. The body of the filter can be made from any material that will hold the water. The most popular is plastic or concrete. The sand and gravel can be obtained locally or purchased. The sand is the same size that is used for making mortar while the gravel is small stone used for concrete. Remember that the filter will not be usable from three to 4 weeks while the biological layer is grown. Water still needs to be flushed daily through the system during this period even though it is not drinkable. Several gallons of water need to be flushed daily through the filter while the biological layer is growing. If the biological layer dies from lack of use or some other reason than the filter needs to be cleaned and it will take another three to four weeks before the water is again drinkable. When water slows down indicating that the filter is clogged then it needs to be cleaned. To clean you need to agitate the sand and flush all biological residue. When you are done the sand should look clean. Now you need to wait three to four weeks for a new biological layer to develop before drinking the water. Several gallons of water need to be flushed each day while the new biological layer is developing.